We all have projects to complete this fall – new programs to start, new internal efforts to kick off, and our never-ending to-do list to tackle. In this week’s blog, we wanted to share some cool and easy ways to successfully manage these projects. Self-driving cars have been all over the news lately. Although the technology they employ is foreign to most of us in the social sector, the project management techniques the technology titans use to create it offers us valuable strategies that can be implemented in our own work. By taking a cue from human-centered design – a process used by the teams at Google, Nissan and Tesla – we can improve the way we coordinate our teams’ work. For those of us who have dreamed of learning their secrets, here’s our chance to think and work like them while solving some of our communities’ toughest challenges. Developers work in phases to build products: plan, build, test, review and deploy. The social sector is stronger at some of these phases than others. We are great at building – starting new programs – and deploying – launching new services quickly. However, we could benefit from the rigor and feedback the tech sector uses to plan, test and review their products. We like to kick-start our efforts by emulating the planning phase. To do this, we love process mapping – with Post-it notes on a flip chart or wall. We suggest starting with one color for each of the following: process steps, resource needs, constraints and responsible party. We sometimes even add a Post-it note for budget items to build a financial model. This process can be used for programs, events and projects to ensure everyone is on the same page and can help you move more quickly. It can also allow the team to revise steps by simply rearranging the Post-it notes. 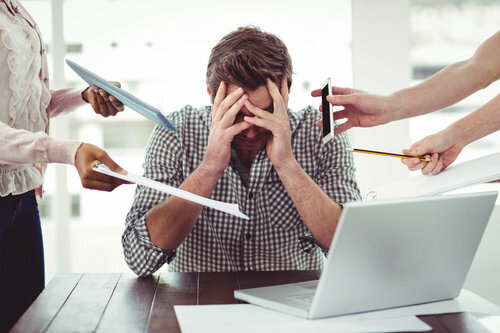 In the test and review phases, developers use this process to iron out the bugs and sometimes have customers use the prototype to see if it is easy to navigate and to their liking. In the social sector, having this feedback mechanism might greatly improve our programs before they are fully launched. This can help ensure all our clients receive top-notch service. 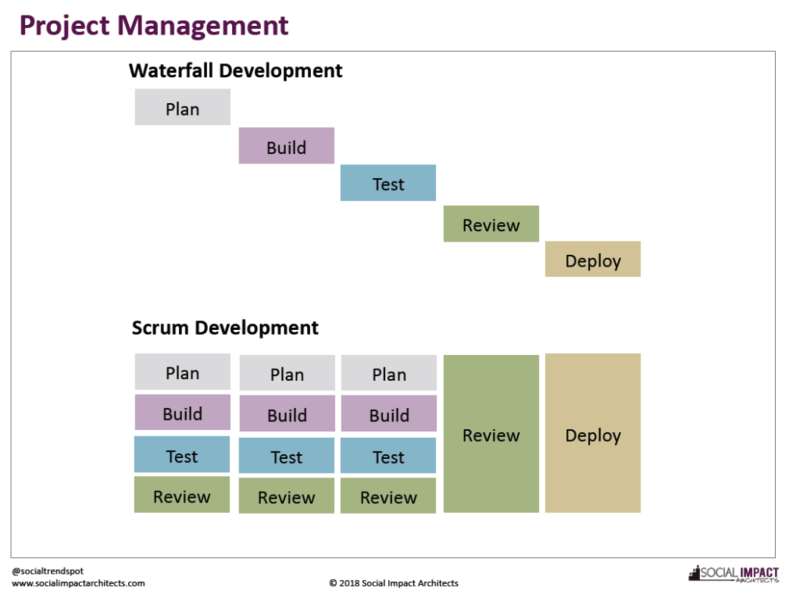 One of the project management approaches developers use is what most of us are accustomed to in the nonprofit sector – waterfall development. In waterfall development, programmers complete one phase of work before moving on to the next. For example, in fund development, we pull donor lists, write appeals, send them and donations arrive. This approach works well when there are few variables that rarely change. However, when there are many components to a project that are interdependent and subject to changing preferences or needs, the nonprofit sector may be better suited to emulate scrum development. In scrum development, staff break down the entire project into small, component parts and fully test and review them before moving on to the next component. In the nonprofit sector this could mean distilling complex projects like collective impact collaborations to smaller, manageable projects and tackling them one step at a time. Instead of being overwhelmed by needing to provide a full array of services, such as financial coaching, employment services, income support, health services and support groups, start small and build up. Determine all the systems you need, build them one by one and roll out one service at a time, fixing bugs as you go along. The scrum approach to project management reduces the risk of overall failure and allows organizations time to change, building confidence with each success. While most of us view technology as completely different from our work in the social sector, learning these secrets can help improve the services we provide our clients and make our organizations more effective at what we do. If you have managed projects in this way or have other innovative approaches for your fall projects, please share them with us.